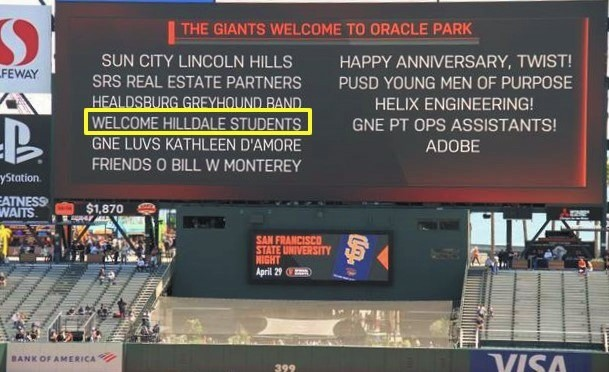 The Hilldale School seventh and eighth grade students recently spent an afternoon basking under the sunshine watching America's pastime at 24 Willie Mays Plaza in San Francisco to see the San Francisco Giants battle the National League West division rival San Diego Padres. 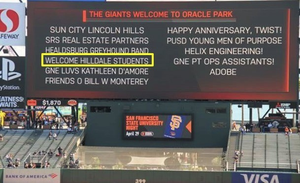 Our name on the 153' wide, 72' high, 10,091,520 pixel, 4K-capable video scoreboard (the first in MLB!) spread over 10,700 square feet sure looks good! Go Hilldale Hawks! Go Giants!